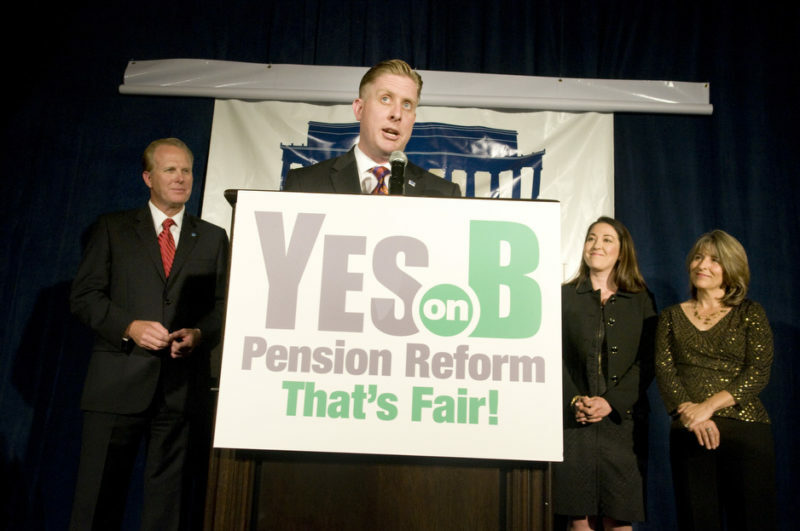 The U.S. Supreme Court decided Monday it didn’t want to help the city of San Diego resolve its newest pension mess. But despite the decisive non-decision, nobody has a clue what’s going to happen to city workers hired after 2012. One thing is growing clearer, though: City employees should not expect any big windfalls. The U.S. Supreme Court decided Monday it didn’t want to help the city of San Diego resolve its newest pension mess. But despite the decisive non-decision, nobody has a clue what’s going to happen to city workers hired after 2012. We aren’t even quite sure what’s going to happen next. One thing is growing clearer, though: City employees should not expect any big windfalls. First, the basics: The high court decided not to review the California Supreme Court’s decision that a 2012 ballot measure, Proposition B, was illegally pushed onto the ballot by former San Diego Mayor Jerry Sanders. The measure, among other things, eliminated guaranteed pensions for future city employees (except for police officers). It replaced them with 401(k)-style retirement programs. The California Supreme Court had agreed with city unions, led by the Municipal Employees Association, that argued the mayor had a legal responsibility, as the city’s lead labor negotiator, to first meet and confer with unions before pushing major changes to their benefits and compensation. The California Supreme Court told a lower appellate court to figure out how to make it right now that it essentially said that the mayor had violated the law. The news: The city tried to get the U.S. Supreme Court to consider its argument that the mayor, as an individual, could do and say whatever he wanted. It was an argument pushed by former City Attorney Jan Goldsmith, who will now be known in San Diego’s history books as the lawyer who failed to prevent this remarkable flub. The U.S. Supreme Court was uninterested in having that conversation. Now what? In one sense, that’s it. There are no more questions about whether the ballot measure violated the law. The question is what the courts do with this information. Last week, the city and the unions and others were at the state Court of Appeal to discuss the California Supreme Court’s mandate to figure it out. The Court of Appeal has 90 days to do that. One option, and a likely one, is that it just tells the city and the unions to accept the decision of the Public Employment Relations Board, which ruled in 2015 that Proposition B was an illegal move by the city. That agency, known as PERB, had decided that city employees should be made whole and city management and unions should get together to come up with how that should happen. But that doesn’t change city law: Pensions are still not allowed for those employees. So city employees hired after 2012 couldn’t be put into the pension system even if that’s what everyone wanted. PERB also said the city and unions should go through a process known as “quo warranto” to have the law officially pulled out of the San Diego City Charter. The city or ballot measure proponents could challenge that all the way back up to the … yes, California Supreme Court. And they seem like they’d want to. April Boling, who was one of the citizens along with the mayor at the time who proposed Proposition B, said that she wasn’t too worried about the remedies that PERB may push the city to handle. What this is really about: Michael Zucchet, the general manager of the Municipal Employees’ Association, said he has no idea how PERB or negotiations would settle how much employees may get to make things right. There are many variables. For one thing, city employees had already agreed, in 2009, to a substantially smaller pension benefit program for future workers. Though we haven’t seen the math, there’s a good chance that employees hired after the 2012 reform have saved and earned more than what may be considered an equivalent pension benefit by this time had they been enrolled in the traditional retirement system. “At the end of the day, this could very well be a non-event in terms of cash money. It’s probably not going to be hundreds of millions of dollars. It may not even be tens of millions. It may be something close to a wash,” he said. But there were two reasons to pursue it, he said: first, to ensure that no city could ever use the initiative process to go around rules about negotiating with labor unions. And second, he said, defined benefit pensions are important. They provide certainty in retirement and that may be worth something beyond just the dollars that would have accrued by now. That’s exactly what’s motivating the other side, though, as well. That certainty is guaranteed by taxpayers. If the earnings of a pension plan come up short, it’s taxpayers who make up the difference. Boling said public agencies like the city will always have an “appetite” for enhancing pension benefits and even if pensions were reasonable now, the only way to make sure employees were not indulged was to end the program. “You’re never fully going to get rid of that appetite without getting rid of the plan,” she said.